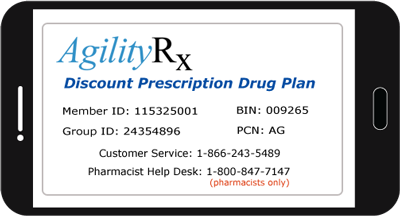 Agility Rx offers a FREE drug pricing tool via AgilityRx.com, to help members locate the cheapest price for their medication. 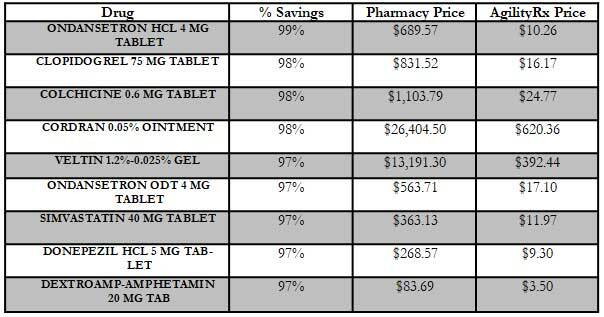 The pricing tool provides estimation on the cost of the medication, and gives members an advantage to find pharmacies with the best pricing around. Our tool allows pharmacies to be located in a 3 to 25 mile radius from the zip code or address entered. From there, members are able to build their drug list using the search bar. For example, if a member searches “Gabapentin 300 MG CAP”, they are able to add the quantity needed and begin the search process. Now you can have the same great pharmacy locator and drug pricing tools right on your smartphone. Again, you will never need to worry about forgetting your pharmacy card, it will also be with you on your smartphone! As the drug list builds, the participating pharmacies and drug pricing tool located at the bottom of the page are displayed. The drugs can be sorted by total cost and/or distance from the zip code entered. Based on our savings of all prescriptions within our network pharmacies, our card allows our members to get the most out of generic drugs. Generic medications are the same as the brand-name medications and are FDA approved to meet certain criteria to be just as effective. Generics are the same as the brand medications in dosage, safety, effectiveness, strength, stability, and quality. Generics are relatively cheaper because generics don’t face the same cost as manufacturers of brand-name drugs, by inventing and clinical trials of the drug. Agility Rx’s discount card are accepted at over 64,000 participating pharmacies nationwide, including most major chains as well as independent pharmacies. Keep in mind, our card, unlike other competitors is eligible for the whole family, including household pets! Download and print your discount card today online or download our app in the App store.